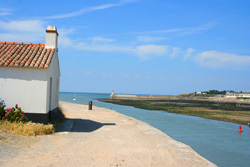 St.Gilles Croix de Vie, Vendee. This attractive seaside resort and fishing harbour on the Atlantic coast was originally two towns, St.Gilles-sur-Vie (south) and Croix-de-Vie (north) which had developed on either side of the river Vie, they were joined in 1967 to form St.Gilles-Croix-de-Vie. Little did Benjamin Beneteau know back in 1884 when he first started manufacturing fishing boats in st.Gilles, that one day his firm would be the world’s leader in the manufacture of sailing boats. Today there are 5 factories in the Vendée producing his boats. 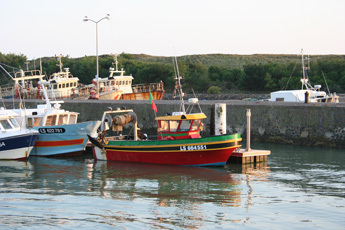 At any season of the year the town has a lot to offer, the busy fishing port is full of colourful boats, and from there it is also possible to catch a ferry to the L'ile d'Yeu or charter a boat to go fishing. With such diversity as the long sandy beach of the Grand Plage, with its beautiful promenade full of shops cafes and restaurants and the rocky coves and small beaches which border the Corniche Vendéene just north of the town, St Gilles Coix de Vie is truly a jewel on the Vendée’s Atlantic coast. The harbour side is a lively place with good restaurants, bars and cafes and there are endless pleasant walks, not only along the harbour front but also back along the river or around from the harbour via the point de la Garenne to the grand Plage, then returning via le Sabliar on either side of the canal. As you would expect from a seaside resort all the water and beach sports are practised here from windsurfing, kite surfing, long and short board surfing, sailing, sand yachts, beach casting and fishing from boats, harbour walls and rocks and much much more. There is an easy pace to life here, with time to enjoy a quiet coffee and watch the world go by, or to take a stroll and watch the sun set, or to pick up fresh vegetables and fish from the daily markets. With the constant ebbing and flooding of the tide the scenery changes, and it is not hard to see why this is a favourite destination for holiday makers. Bike Hire; Bouticycle45 Quai Gorin. Tel. 02 51 55 47 09. Gateau Gerard. 50,rue Calvaire. Tel. O2 51 55 48 56. Canoe Hire; Canoe du Marais. rue Tressanges Givrand. Tel.02 51 54 46 81 . Base Cano Evasion. Chemin de la Justice. La Chaize Giraud. Tel 06 67 09 80 62. Horse riding; St.Reverend. Centre Equestre de l'Aumariere. Tel.06 84 87 45 04. Spectacles Equestrian every Tuesday & Friday evening, 20h to 22h Tarif 8€ under 10's 6€. Karting; West Adventure. St Reverend.Nr. 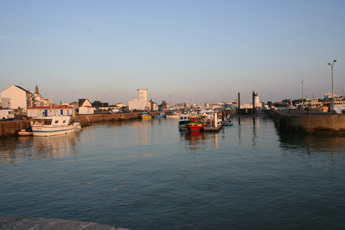 St.Gilles croix de Vie. Tel 02 51 54 66 93. Discotheque: Saint Reverend, L'Albatros Baubretiere 02 51 54 05 68. Markets; St.Gilles Side. Every Tuesday, Thursday and Sunday mornings. Croix de Vie side. Every Wednesday and Saturday mornings. Wi.Fi. Within 100 meters of the Tourist Office. 3€ per week payable on line. Excursions; Campagnie Vendeen. Daily trips to Ile d'Yeu and sight seeing trips.